It came as a very pleasant surprise to hear that the famous Kitty Pridden had talked enthusiastically about my book at a recent event held at Simpson’s Tavern in London, where she co-hosts those entertaining evenings called ‘the Georgian Dining Academy’. This was quite unexpected and I am most grateful to Kitty and to Jonny Haart, who read some passages from it. It was equally exciting to see that one of the guests had been moved to buy a copy from Wordery, and wrote a fulsome review there. 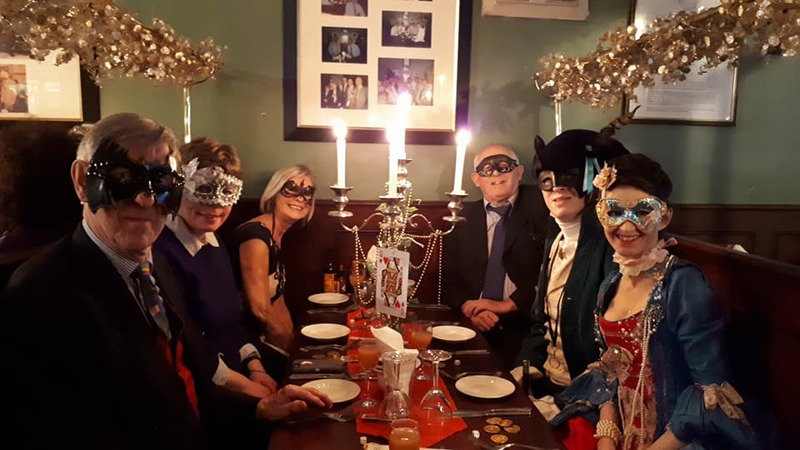 Not long ago it was my pleasure to attend one of those marvellous and convivial evenings in Simpson’s Tavern, London, organised by the Georgian Dining Academy and hosted by Miss B. (of ‘Takes a Walk’ fame) and Miss Kitty Pridden. During the merriment our hosts regaled us with various interesting and amusing Georgian ‘gems’, in one of which the charming Miss Pridden sang the praises of ‘Prinny’s Taylor’, and Jonny Haart read a few passages from the book, all of which was very well received. Kitty’s enthusiasm was infectious and I ordered a copy as soon as I could. I wasn’t disappointed – this book is a tour de force. Being something of a connoisseur of the Georgian/Regency period I have read many books about it and several lives of Prinny. Considering that they all say that his most noticeable trait was to ‘dress to excess’, it is indeed odd that none of his biographers has ever taken the trouble to look into what clothes he was buying, and who from, particularly during his pre-Brummell period. I include in the list such stalwarts as J. B. Priestley, Christopher Hibbert, Saul David and Steven Parissien. The latter even devoted a whole chapter to ‘Clothes and Militaria’ but it is obvious that he had never heard of Louis Bazalgette. It is true that Charles Bazalgette was approaching the subject from a different angle, but he seems to have had little difficulty in tracking down nine years of Louis’ detailed accounts and has painstakingly transcribed them (all 285 pages!). This was a major breakthough and makes this book unique and fascinating, considering that none of this information has ever been published before. It isn’t just about tailoring and Prinny of course, although they of course take up much of the page-space, but it describes Louis’ later life as a West and East-India merchant and innumerable aspects of Georgian life. In short, to use a cliche, it really is a microcosm. The author is, as he says, a bloodhound, and if he finds a lead he follows it relentlessly. For instance, even a minor character – a thief who stole some silver spoons from one of Louis’ sons – has his story followed up. We see his trial at the Old Bailey, his transportation to Australia and how his life turned out afterwards. I find it a pleasure to dip into the book at random and become absorbed in whatever I find. I cannot recommend this book more highly! Good for you! I lost track of that group when a blog they had done went private, but then again I never spent time with them in person. I will fish around for ways to stay in touch with their activities, and am glad to see this blog here to stay in touch with yours.